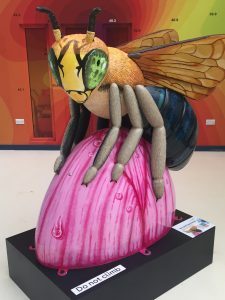 Manchester Royal Eye Hospital’s atrium was a hive of activity on Monday 15th October as their newest resident to the atrium, the ‘Bee-yond Expectations’ Bee sculpture, commissioned by Henshaws for the Bee In The City event, was unveiled. 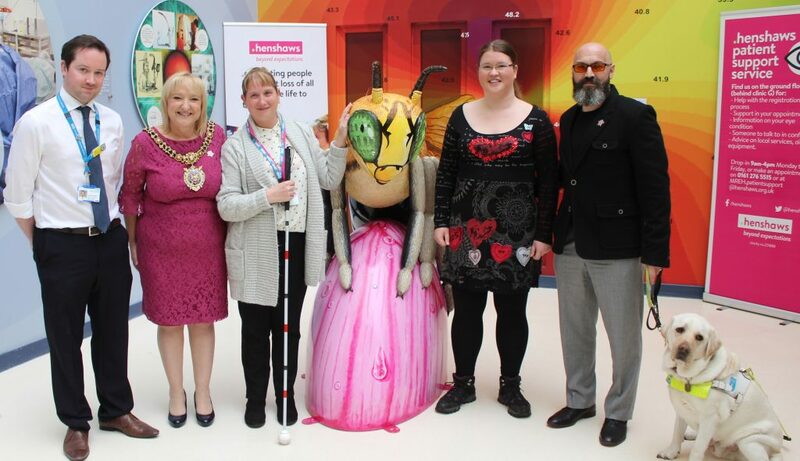 Councillor June Hitchen, Lord Mayor of Manchester, was guest of honour at the event to preside over the official unveiling that was attended by representatives from Henshaws and Manchester Royal Eye Hospital as well as eager members of the public. Councillor Hitchen’s We Love MCR Charity was chosen as the charity beneficiary of Bee in the City and the money raised through Bee in the City will support the We Love MCR Stronger Communities grant programme. Welcoming The Right Worshipful the Lord Mayor of the City of Manchester, Henshaws representatives who have been key in implementing the sculpture and members of the public was John Ashcroft, Chief Executive of Manchester Royal Eye Hospital. John expressed his delight that the sculpture was finding its ‘forever home’ on the ground floor of Manchester Royal Eye Hospital and how proud he was of the achievements of the hospital and the 25 year strong partnership with Henshaws that benefits service users across Greater Manchester. Henshaws’ Director of Community Services, Robert Cooper, also delivered a speech as to how receiving support during sight loss diagnosis is important and the ‘Bee-yond Expectations’ Bee is a great opportunity to highlight the brilliant partnership between the charity and the hospital. When it came to the grand unveiling, Mayor Hitchen asked for a few volunteers to help with the big reveal. Joined by service users and visitors, as well as staff from Manchester Royal Eye Hospital and Henshaws, Mayor Hitchen proudly removed the covering to rapturous applause so everyone could see the Bee in all its glory. Guests were then treated to a reading by local poet and Henshaws service user, Dave Steele, whose work captures the emotional and physical challenges faced when he lost his own sight. The event closed with refreshments and a chance for visitors to interact with the Bee and each other and find out more about support for people going through sight loss. Although Manchester Royal Eye Hospital is no stranger to bees (housing a small apiary on the roof of the hospital), this industrious insect is a different spectacle altogether and has already created an excited buzz with members of staff and the public alike.